Alright, here we go! I decided to participate in The Classics Club Spin #18. I thought I was participating overall, but couldn’t find my list of 50 classic books. I mean, not that it really matters because I probably would still have 50 books on my list. Anyway, how does the Spin work? It’s as easy as 1-2-3. Really. Choose 20 books from your Classics Club list that you have yet to read and post the list to your blog before August 1st. On the morning of August 1st a number between 1 & 20 will post and you’ll have until August 31st to read your Spin book and post a review. What!? How simple could that be? For this Spin the way I selected the books was to write the first 20 books that popped in my head from my Classics Club list. For a couple of numbers there are two books listed because they’re short and I thought I’d try to come as close to book length as possible. 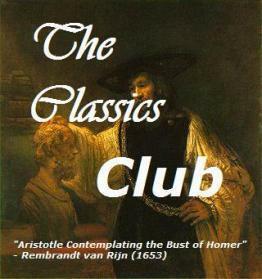 Which book would you like to see me read for The Classics Club Spin? Update: Apparently, I liked Candide and The Prince so much I had it on my list twice; so I updated #18 H. G. Wells. Soooo many good ones on here. I Know Why the Caged Bird Sings and Giovanni’s Room are two of my all-time favourites so a part of me hopes you’ll get one of those. The two books by H.G. Wells also peak my curiosity too as I’ve just read The War of the Worlds by him and really enjoyed that. I wonder what his other stories are like. I’m definitely good with Caged Bird Giovanni’s Room, but would choose Caged Bird first. Ceremony is one if my favorites, too. Almanac of the Dead seems really interesting. I’m a little intimidated by it because it’s supposed to be so intricate, but I’m sure it won’t fail. Not sure if the Kite Runner qualifies – don’t the books need to be 20+ years old in order to be included? I double checked when I put my initial list together and there is no time period for according to the Classics Club site. It can be a modern classic. I wanted to make sure my list was diversified and use books I already own. It’s really hard to find classics by middle eastern authors and Asian authors that are Chinese or Japanese. Oh, I just read Giovanni’s Room a couple of weeks ago (haven’t reviewed it yet) and it’s so good! Baldwin was a genius. Great books here! Thanks! I was supposed to read it with an online book club this month but didn’t. I love Baldwin and I think this is the only one I haven’t read. Yay, this is a great list! Oh and I love what you did with #10 & #18…soo clever. Are you hoping for any particular number? Yeah, I’ll go with clever. 😏 But more likely just bad proofreading. I would probably want 4 or 19 chosen.🤞 They have been on my TBR forever. I love seeing all the lists from the Classics Club, because I learn about new authors. Several authors on your list are new to me. I would pick The Moonstone, as it’s on my CC list, but not for the spin. Or The Name of the Rose, which I would like to re-read. I hope you get a number that you like! What did you think of The Name of the Rose? I could go with the Moonstone it’s been a long time since I read it and plus it’s on another challenge reading list. Well, I read The Name of the Rose 25 years ago, but I remember that I enjoyed it a lot! Since then I have acquired a copy of “The Key to the Name of the Rose,” which should help with all the cultural references and Latin phrases for my re-read. Great list, Erica! I love Jane Eyre, Turn of the Screw, and The Moonstone; and am very curious about Giovanni’s Room, I Know Why the Caged Bird Sings, and Parable of the Talents. So any of those would be my picks. Thanks, Jessie! I just read the Jane Eyre graphic novel for Dewey’s Reverseathon and I now I really want to go back and reread the book. Truthfully, I really need to get Caged Bird read. I keep putting it on reading challenge lists and it never gets read. Same here about I Know Why the Caged Bird Sings. It’s on my main Classics Club List and I’ve been meaning to read it for a few years now. The Jane Eyre graphic novel sounds like a lot of fun!